A temporary restaurant is the opening scene for a multiple-month community based arts and ecology project where we bring to life an empty plot of urban land and invite the community to cultivate food, relationships, and creativity. This temporary restaurant is the opening scene for a community based arts and ecology project where we spend several months to bring to life an empty plot of urban land, building a natural garden, and inviting the community inside to cultivate food, compassion, relationships, and creativity. Finally, when the food is grown, we invite the customers back to the restaurant for their dinner, prepared by Japanese macrobiotic chef, Kaori Tsuji. The dinner is enhanced by a time-lapse video installation of the food growing, and an exhibition of the artistic outputs made by the community during our ten weeks of garden art workshops. The garden design and workshop series is based on years of academic study in arts and ecology in the UK and Japan, as well as multiple years working with and learning directly from the world’s leading sustainable “natural” farmers. 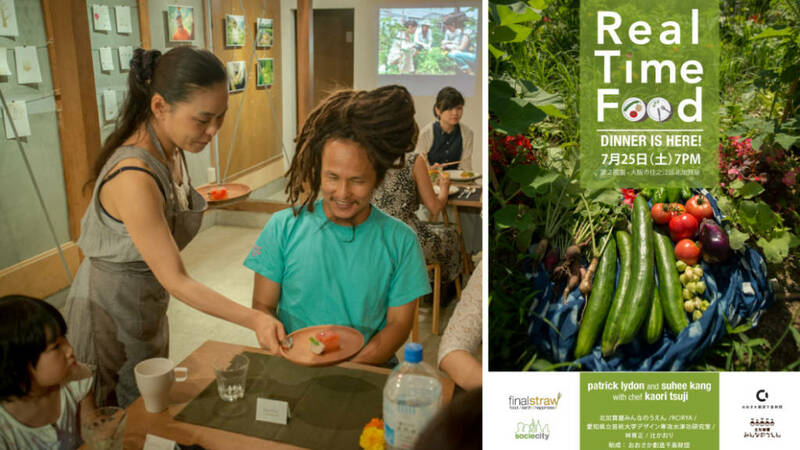 The goal of REALtimeFOOD is not only about ecological art making, or learning about plants and soil, but about giving people the opportunity to cultivate awareness and compassion for environment around them. From this compassion grows deeper and more meaningful relationships, both with the living things in a garden and with our fellow human beings. The relationships cultivated by individuals here travel into their lives outside the garden, permeating their relationships with other people and with the living world around them. Participants cite the project as being not only entertaining, but amazingly eye-opening, bringing our relationships with the environment to new levels and expanding our view of the world immensely. A second version of the project was produced in Megijima, Japan (2016) by the Final Straw Japan team, directed by Patrick and Suhee, with our superstar producer and project manager in Japan, Kaori Tsuji who handled logistical support, as well as being our head chef and natural garden manager.